Notre Dame senior Simon Harting received a $500 college scholarship courtesy of Wendy’s at the Wendy’s High School Heisman ceremony on Tuesday. 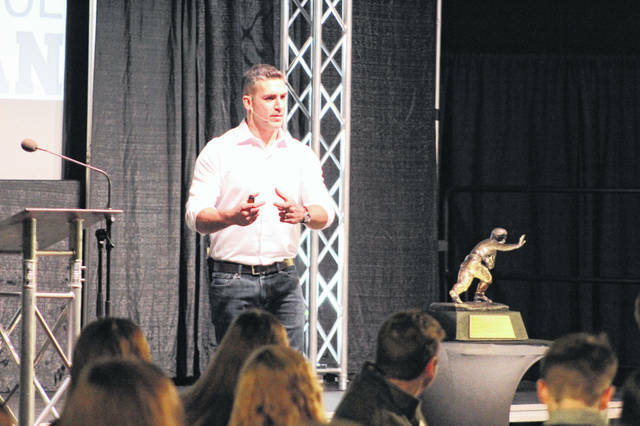 Focus 3’s David Trichel was the key note speaker at the Wendy’s High School Heisman ceremony in Huntington on Tuesday. The students from Ohio that were recognized on Tuesday at the Wendy’s High School Heisman ceremony at Big Sandy Superstore Arena in Huntington. 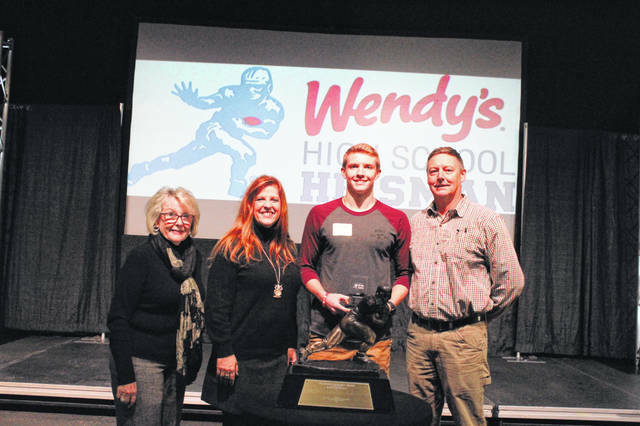 On Tuesday afternoon in Huntington, W Va. Wendy’s joint partners from the Tri-State area honored those students who excel both athletically and in the classroom with being named their school’s representative for the Wendy’s High School Heisman award. Over 150 students from the Tri-State area were selected and attended the ceremony held at the Big Sandy Superstore Arena in downtown Huntington Tuesday morning. 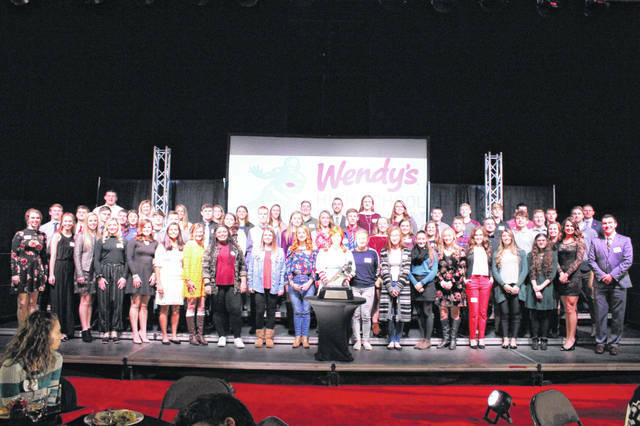 Of the twelve high schools in Scioto County, two representatives from each school were chosen by Wendy’s to have qualified and be recognized among their peers. To begin the ceremony, Scioto County’s own and member of the Schmidt Family Restaruant group, Juice Schmidt, addressed the crowd with the story of Dave Thomas, the founder of Wendy’s Old Fashioned Hamburgers, and how at the age of 15, Thomas dropped out of high school to go work for a living before later returning to school and completing his GED. Schmidt then introduced the MC for the event, WSAZ sports anchor Jim Treacy. Treacy proceeded to speak to the student athletes in attendance before himself introducing the key note speaker for Tuesday’s event, Focus 3’s David Trichel. Trichel himself is a noted speaker for the Focus 3 group. Before being a member of Focus 3, Trichel began his career as a staff member of the 2007 LSU football national championship team, and most recently, a staff member of the 2014 Ohio State football national championship team. Trichel’s message to the group of young adults was simple: E+R=O. What Event do I have + What Response do I need = What Outcome do I want? He urged those in attendance that if they want something in life, they need to act in such a way that would benefit themselves and the others around them to be able to reach their ultimate goals they have set for themselves. Harting also was one of four student athletes in attendance who was selected at random for a $500 scholarship, courtesy of Wendy’s.